A popular holiday destination, Dubai is synonymous with luxury. From awe-inspiring architecture and mind-blowing theme parks to desert safari and lip-smacking cuisines, Dubai promises you a fun-filled experience. Take a look at some of the best Dubai hotels which are sure to take your holiday experience, a notch higher. Expect chic decor, fine-dining restaurants, rejuvenating spas and more. So, what are you waiting for? Your Dubai visa is just a click away. Renaissance Downtown Hotel is known for its unique dining experiences and elegant interiors. Tantalise your palate with international cuisines prepared by world-class chefs. Indulge in the fitness centre or the spa; take a swim in the indoor or outdoor pool. 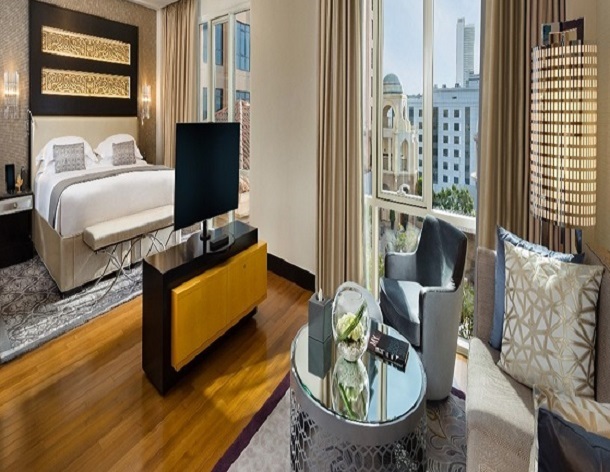 And enjoy the views of Burj Khalifa and Dubai Water Canal from the comforts of your room. Located amidst 65 acres of landscaped gardens, One&Only Royal Mirage is an abode of luxury. Famous for its Arabesque design, the rooms here, have a private balcony that will delight you with breathtaking views of the sea and landscaped gardens. Lounge amid shimmering pools and fountains, dine alfresco under star-studded skies to experience one of the best luxurious vacations ever. Situated along Dubai's retail strip 'The Walk', Amwaj Rotana Hotel is home to elegantly furnished rooms and suites. Take in the fantastic views of the Arabian Gulf and Palm Jumeirah whilst pampering yourself to ultimate luxury. Apart from gastronomic delight, enjoy live entertainment, happy hours, and amenities which include Shisha, Sauna, Jacuzzi and many more. Nestled in the Madinat Jumeirah beach resort - Al Qasr aka The Palace is adorned with lavish interiors, mosaic tiles and Swarovski crystal chandelier. It is home to palatial guestrooms adorned in traditional Arabian style. Air-conditioned souk, gyms, turquoise pools, world class restaurants, lounge access, whirlpool tubs and an award-winning spa of this plush hotel attracts travellers from across the globe. Tucked away on Sheikh Zayed Road, the Kempinski Hotel Mall of the Emirates features suites offering incredible views of Dubai’s skyline and beautiful Chalets overlooking the snowy slopes of Ski Dubai. Enjoy direct access to indoor skiing at Ski Dubai and shopping in the Mall of the Emirates. It houses three restaurants, cocktail lounge by the pool, gym, spa and a tennis court.